Wood-covered residences are in very short supply in Manhattan, but this handsome development is the first in many decades to add to the inventory. The lower half of the 14-story building is partially "wrapped" in "off-the-shoulder" style in large sheets of nicely dark stained wood. The "wrapping" is around the southeast corner of the building but only extends up to the 10th floor, giving the building, the rest of which is covered in light-colored masonry, an asymmetrical "look." The thin panels are extremely attractive and despite their material appear very high-tech. Indeed, at first glance one is tempted to think they are bronze or aluminum, perhaps because of the dark metal covering a very modern art gallery structure at the northeast corner of Tenth Avenue at 23rd Street just down the block. (Just to the north of this building, a car-wash occupies the southwest corner at 24th Street and for an older generation nothing is much more high-tech than a car-wash.) Directly across Tenth Avenue is the distinguished, full-block residential enclave known as London Terrace. This may not be the South Pacific, but it is not hard to imagine Mary Martin singing that she will "wash that man right out" of her hair on this quintessential block of the "new" Chelsea, a Chelsea that teems with energy, abounds in artsiness, glories in some landmarks and a rejuvenated riverfront forested with some industrial blockbusters. When this development opened its sales office in the fall of 2004, all its 22 units were snatched up in about 36 hours, a reflection of the neighborhood's high desirability and the project's distinctiveness. 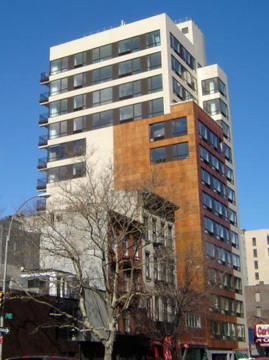 In a October 21, 2004 article in The New York Sun by Julie Satow, Eileen Spinola, the head of residential development for the Real Estate Board of New York, was quoted as stating that "this is one of the first big public recognitions that the Far West Side is profitable for investors," adding that "buyers who missed the beat with downtown, Harlem, and other hot neighborhoods are approaching the West Side with a vengeance." Jim Brawders, a senior vice president of the Corcoran Group, who was the exclusive marketer of the building, which is known as Vesta 24, with his partner, Cay Trigg Blau, was quoted as maintained that "this is the fastest I have ever sold out a building." The building has a concierge and 22 condominium units but the sponsors and developers kept five units for themselves. Most of the apartments on the lower floors have 1,421 square feet with two bedrooms, two bathrooms and a terrace or a balcony and initial prices around $1,100,000 to $1,340,000. The four full-floor penthouses have wood-burning fireplaces and roof decks and prices that ranged from about $2,600,000 to $3,000,000. The apartments have stainless steel kitchen appliances, Miele cooktops and wall ovens, Bosch dishwashers and kitchens with moveable islands. The developer is the Vesta Group of which Mark Blau of HuDu Development, who developed the Duane Park Building condominium in TriBeCa, is a principal. Garrett Gourlay is the architect and James D'Auria Associates did the interiors.